Our practitioners never stop learning. 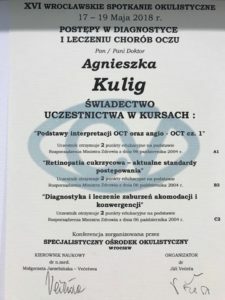 One of our practitoners, MD Agnieszka Kulig participated in the „Practice for Practitioners” conference held between 17th-19th May 2018 in Wrocław. She obtained new certificates in children’s and infants’ ophthalmology. Retinomax 3 is a diagnostic and examination device suitable for infants as young as 3 months old. Book your appoitment now and have your and your child’s eyesight tested with this innovative device.